With so many Australian campervan companies and types of vehicles available, deciding which is the right one for you can be a difficult decision. 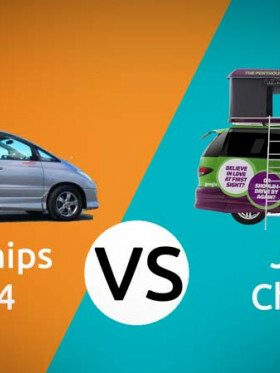 So you don’t have to spend hours researching all of the options for your upcoming road trip in Australia, we are putting all in the information in front of you that you need to compare two similar campervans. In this article we are comparing 2 berth budget campervans that are suitable for a young couple or two friends looking to explore. Neither of these have a bathroom, but they do have better cooking and food prep facilities and more room than a mini campervan. If you are hiring one of these campervans then you’ll probably be wanting to stay mostly at campgrounds and holiday parks so you can take advantage of their showers after a long day of exploring. While both campervans that we are comparing are 2 berth, the Hippie Hitop does have room for one child between 8-13 years old to ride safely as well. The Hippie Hitop campervans are a Toyota HiAce that are at least three years old. They can be automatic or manual, and consume around 13 litres of petrol per 100 kms. The Mighty Highball vehicles are a Toyota HiAce or similar that are five years or older. They are also either manual or automatic, and are likely to consume about the same about as petrol as the Hitop, although we can’t confirm this at the time of writing. Who are the companies we are comparing today? While you may not have heard of Mighty and Hippie, you are probably familiar with their parent companies. Hippie is the cheaper branch of Apollo, while mighty is the budget subsidiary of Britz and owned by Tourism Holdings Limited. As they are backed by the largest campervan company in Australia (THL), Mighty is able to provide great value to their customers throughout their range of 2,3,4, & 6 berth campers. They aim to make holidays accessible for everyone no matter what their budget, and have branches scattered across Australia. They include all the easy to use essentials to make your holiday more comfortable, and have a simple self-check-in process so you don’t have to wait to get your adventure started. 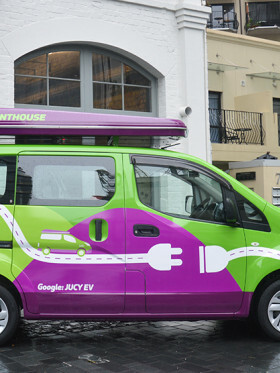 Branded with cool retro orange and white paintwork, Hippie’s campervans can be found across NZ and Australia. They have the newest fleet in the budget market and are specifically aimed to those on a tight budget. They even allow drivers aged 18-21 to rent their vehicles. Hippie makes maintenance a top priority and include all the maps, campground guides and equipment that their customers will need for their trips. For purposes of this article, I made an enquiry for the 11th March 2019 to the 25th March 2019 (2 weeks), picking up and dropping off from Sydney. Do note that the daily base rate for both of these campervans can vary according to the time of the year and seasonal promotions. The prices mentioned for both companies include a standard insurance excess of $3500. Please note: Prices are one time unless otherwise specified You also have the option of choosing Motorhome Cancellation Charges Cover for AU$5.95 per day for both models. When you rent the Mighty Highball, there are additional extras such as an awning, first aid kit, and an express return pack with toilet emptying service. The Hippy Hitop has a lot more to offer including a gas refill, heater/fan, satellite phone, toilet chemicals, a toll package and a WAT & RAP bundle. From just the initial cost perspective, Hippie are just over $100 cheaper for this time period – extra cash that could be going on food or campground fees. As well as the good rental price, they have more to offer in terms of additional items to help make your road trip more comfortable. At first glance, both vehicles look similar apart from the different paintwork on the outside. You’ll see a roof extension for room to stand up in, and more windows for added light. The inside is pretty similar too. For the day setup, there are two bench seats with a table in between, and a kitchen area for preparing meals. Both campervans have a sink near the door, a microwave and two gas hobs up near the driver cab. The spacious dining area is ideal for enjoying meals, reading or playing games, and there is ample storage space for luggage. When it’s time to sleep, the bench seats and table convert into a double bed measuring 1.90 x 1.60 m. Since these vehicles are virtually the same, it’s hard to pick a winner. Based on the fact that there is space for one child and they have newer vehicles…. It’s good to know that both companies give you a standard insurance excess when renting, but you should definitely consider upgrading this to reduce your excess. If you do happen to get involved in an accident, then you’ll probably be a lot better off financially but it’s important to always read the fine print of your insurance cover. 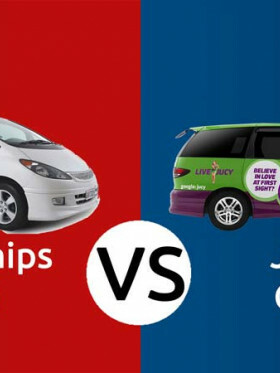 Let’s compare what options you have with these campervans. Mighty has a program where one of their travellers win their holiday back – a nice incentive at the budget level. Being part of THL, when you rent a Mighty camper you get access to the THL Roadtrip App. This gives you your location on GPS and all of the petrol stations, toilets, campgrounds and other important facilities in the surrounding area. It includes vehicle help videos as well as the ability to see feedback and recommendations from other travellers. Mighty also have a sharing recipes for on the road initiative so you can get some great ideas for cooking on a budget in your campervan. Hippie doesn’t have too much to offer apart from their Hippie Club which gives you access to deals on thousands of experiences across Australia. 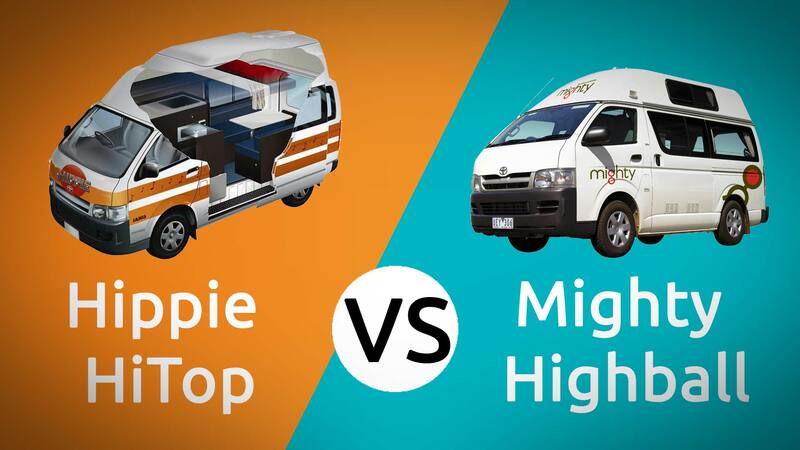 Both Hippie and Mighty offer excellent budget 2 berth campervans that are extremely similar in terms of features and design. They offer the same kind of sleeping and cooking arrangements for a comfortable journey. While Mighty do have some extra incentives as a company for renting, Hippie have a lower daily rate, more additional extras for purchase, and newer vehicles. Get a price comparison of Hippie vs Mighty using our price comparison engine.